Destanie was one of my beautiful brides last year. (Her wedding can be seen here.) She now has a brand new bundle of boy on the way! And it is pretty unfair how good she makes pregnancy look! She met with me on a freezing cold day, of course just after a warm spell, to pose for some baby belly photos and to model some beautiful maternity belts for Hopefully Romantic. Katherine Marcoccia is the creator at Hopefully Romantic, and she makes amazingly beautiful pieces for brides, expectant mothers, and anyone who wants to wear gorgeous feminine pieces. Every item is handcrafted out of beautiful fabrics, beads, trims, lace and even touches of paint. Destanie’s adorable little baby bump was the perfect way to show off Katherine’s work. And after freezing and nearly turning blue, Destanie got to go home to warm up under a blanket with a hot drink. Now she is just waiting for that beautiful little baby boy to join her family. MichelleFlowers - Sonora California has a great Maternity photographer who does a great job capturing life’s special moments. 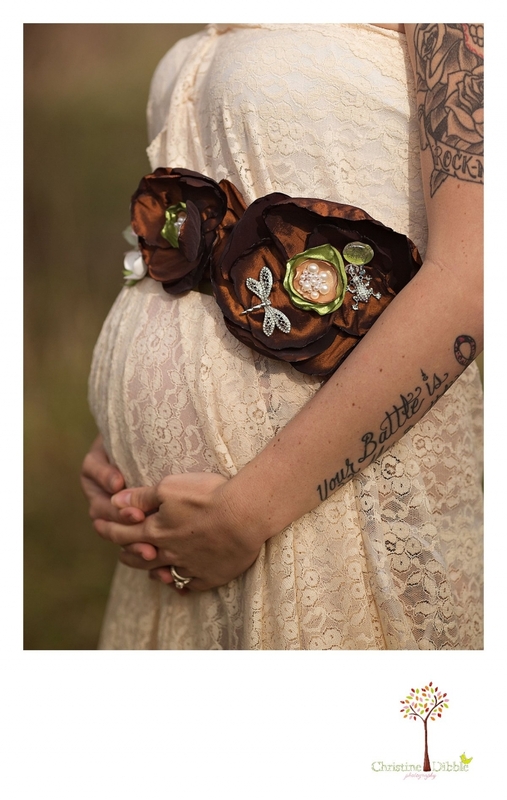 I love the Maternity Sash and the beautiful colored wraps used during this photo session of this beautiful expectant new Mommy! What a beautiful little baby bump too!! Christine Dibble photography has a wonderful way of capturing this expectant Mommy and she does a wonderful job telling the story through her lens!! Esther - These are beautiful maternity photos, Sonora California photographer. I love the way you played with the light, and the colours are so dreamy and beautiful. GORGEOUS photos!! Teagan Photography ~ Edmonton Newborn Photographer - This maternity session is stunning! You are an incredible Sonora California Maternity Photographer. Candy Hoehn - Beautiful maternity session! Sonora California is so beautiful and so is your client! Stephanie de Montigny - Newborn Photographer - I absolutely love the location you chose for this maternity portrait session, and the way you played with the light is fabulous!